2008 Annapolis reunion was, according to those who have been regulars to the reunions, one of the best ever. We had a great hospitality suite, which allowed lots of space for visiting, memorabilia displays, and endless food and drink for the annual meeting. The Annapolis Sheraton was a great host facility and their group sales and kitchen staff worked to make sure we were well taken care of. There was plenty of time for the ladies to visit the giant mall right across the street and with restaurants essentially right in the parking lot, we were able to keep our group fairly close together throughout the reunion. Two of our tour highlights were our memorial ceremony at the Vietnam Wall for our three shipmates killed in action. We also had a very nice ceremony at the Navy Memorial where we dedicated the Goldsborough plague. 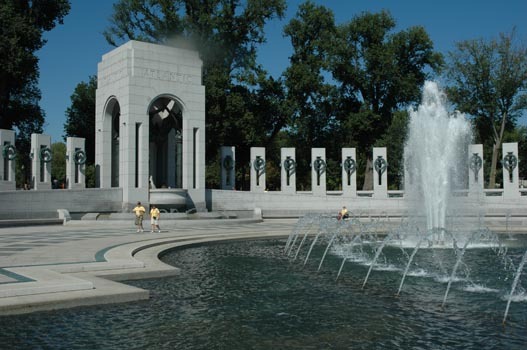 While in Washington we also visited the World War II Memorial and Korean War Memorial. We came so close to having our White House Tour, which took darn near an act of Congress to get. We were at the visitors gate when we found out the “W” had returned early from Texas because the storm that hit there was much less powerful than anticipated. There was a speech to the National republican Convention later that day and where he gives his speeches is right on the tour route. So for security purposes all tours were canceled that day. Most voted to return the next day so we could tour Arlington Cemetery and see the changing of the guard. Our visit to the Naval Academy was extremely interesting as was lunch at the “O” club, which followed our Memorial service in the Academy Chapel for all fallen shipmates. On Labor Day, the first full day of the reunion, we had all day to tour the Baltimore Harbor area where the ladies got another opportunity to shop. Thursday night’s annual banquet and auction was a full house. We even had a special guest who explained in detail the progress on the attempt to bring the USS Adams to Jacksonville to be a floating museum for all DDG’s in that class. The auction again raised a tidy sum of money for our savings account. Unfortunately, due to illness and travel restrictions, we missed a few of our long-term attendees. Any time we are on the right coast the numbers are down. So hopefully, with the membership voting Colorado Springs for the 2009 many of our left coast shipmates will make the trip. Elections were also held for the office of President and Vice President. The membership was actively solicited for volunteers to assume these positions. Roy Satterstrom set the tone when asked to be President his response was “I’m too damn irresponsible for that”. Chip Chapin and myself will serve our last two-year term. So when the 2010 reunion rolls around the Association, according to our bylaws, we need to have two people prepared to assume those offices, as we can no longer serve.